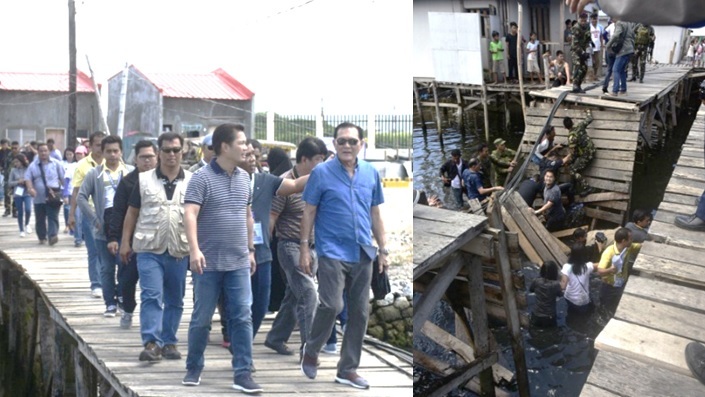 MANILA, Philippines - Zamboanga Mayor Maria Isabel Climaco-Salazar along with Representatives Alfredo “Albee” Benitez and Celso Lobregat and a few other city officials fell into the water after a footbridge they were using collapsed on Thursday, April 26. The officials were in Barangay Rio Hondo, Zamboanga City to inspect a housing project made for the evacuees of the Zamboanga siege back in 2013. After falling into the murky waters, the officials only suffered minor injuries. Benitez, who is the chairman of the House Committee on Housing and Urban Development tweeted about the incident. He called out the lack of maintenance of bridges and houses. Nahulog kami ng aking mga kasama sa tulay na nilalakaran namin papunta sa mga housing on stilts sa Brgy Rio Hondo, Zamboanga City.